What a winter! Although our clients are always delighted to arrive on the island, never more so than these days! Spring break this March has a whole new meaning. Last month, I shared how much we love seeing families enjoying the island together, and on a personal note, my husband and I enjoyed sharing in an extended family vacation here with two of my grandsons. We hope you are inspired! And to make your family vacation not only fabulous, but affordable, remember Value Season pricing begins April 16. Take a look at the villas participating in our value-laden Drive, Dine & Relax packages and a peek at our Pinterest board, the Glorious Pools of St. Barth. Kids do love those pools! We hope we will see you and your family on the island this spring or summer. P.S. Kudos to our U.S. and island-based team for all their great work resulting in St. Barth Properties being recognized by Travel + Leisure as one of the “World’s Best Villa Rental Agencies” and an All-Star for St. Barth in the March 2013 issue. Read all about it below in SBP News. Poised high in Pointe Milou, this sprawling, sumptuous 5 bedroom vacation home offers its guests the ultimate St. Barth villa lifestyle. Designed to frame the magnificent seascape and capture both the sunrise and sunset, it artfully creates a seamless transition between indoor and outdoor living. A 70 ft. solar-heated infinity pool is the focal point of the bi-level outdoor space that accommodates sun worshipers, shade seekers and billiards players – yes, there’s a pool table. An air-conditioned open floor plan incorporates a sleek kitchen that receives the first light of day, a dining area, and a comfortable salon whose 60" plasma TV and Bose surround sound allow it to function as a home cinema. Five en suite bedrooms are beautifully appointed and feature HD-TVs. A beach lover’s dream on one of St. Barth’s most gorgeous beaches – Flamands. This is a two bedroom villa in which guests can relax in air-conditioned comfort enjoying the seascape. There’s loads of outdoor living space; tropical plantings divide the pool area from a sheltered dining nook and cushy chaises overlook the water. We love the staircase down to the beach. Sophisticated you, yearning to come to St. Barth for all that fabulous shopping, fine dining and French culture. You’ve taken our suggestion of a stay at the Hotel Carl Gustaf. Your bonus? A touch of Sweden – this regal hotel is named for its king – and a deliciously decadent spa. You’ve opted for the Deluxe One Bedroom Pool Suite with its full view of Gustavia’s picture-postcard harbor and the lush hills dotted with the iconic red-roofed villas. It’s all so St. Barth. You are sure to love the full-sized air-conditioned living room with plush comfy seating and all the techno amenities: LCD TV, DVD player, iPod docking station and complimentary WiFi. It opens to a private terrace with tropical foliage and your own plunge pool. The fully-equipped kitchenette is a nice convenience. The bedroom (king) is accessed through a set of French doors, and the sumptuous marble bath is en suite with a private WC. St. Barth Properties is pleased to announce that company founder and President Peg Walsh was again recognized by Condé Nast Traveler as one of the world’s top Villa Specialists worldwide – and the best for St. Barth. This is the eighth consecutive year (since the award’s inception) that Peg has received this accolade which is based on the criteria of customer service, exceptional properties and destination expertise. Peg Walsh and Tom Smyth (St. Barth Properties President and VP) led the U.S. and island-based teams of St. Barth Specialists and concierges in a round of high fives when the March issue of Travel + Leisure hit the stands proclaiming the company as one of the “Best Villa Rental Agencies” in the world with a bonus All-Star status for St. Barth. All those rigorous villa inspections, restaurant reservations and prime-time massage appointments have paid off. Everyone is as pleased as Ti-Punch with the accolade. We are excited. Today is the official start of the 2013 St. Barth Bucket Regatta (March 28-31). 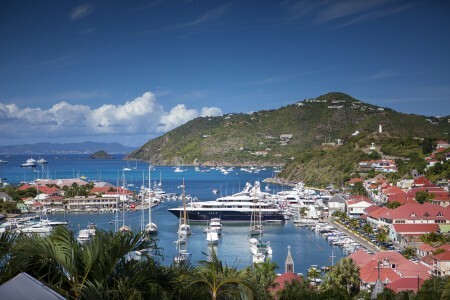 This annual regatta brings the world’s biggest and most fabulous yachts into Gustavia’s harbor. The fun will continue April 8-12 with the 4 edition of Les Voiles de St. Barth and all its gala parties. The buzz-worthy PaCri Restaurant, seaside at the Taïwana Hotel has made some delicious changes to its Italian menu. Take a peek. PaCri is open for dinner. The Taïwana Restaurant, which is open for lunch and has a different chef, serves up a French menu. This impressive 2+ acre property was once the site of an acclaimed boutique hotel and gourmet restaurant known as François Plantation. Once famous for its incredible gardens, the property meanders along the crest of a beautiful hillside in Colombier. Whether you intend to renovate and reopen as a hotel and restaurant or convert the property into a private estate, the possibilities are limited only by your imagination. There is ample space to create a compound that would include a main residence, guest houses, a spa and a caretaker’s house. If you have been looking to create a luxury boutique hotel or a spectacular personal residence, this is your chance! We wanted to comment on our finding a new, small but wonderful restaurant, Entre Deux in Gustavia, not to be missed. Villa Adamas was just perfect for us. The view of St. Jean was spectacular from the beautiful terrace. We especially enjoyed having the American satellite, especially for the music channels! The workout room downstairs was also great! We used it almost every day; it made us not feel so guilty after all those wonderful meals! We do appreciate all you do to make our visits there so easy!